High-Flow, Non-Slip And Colorful. Protect Your Drain and Keep it Clog Free. Stuff Points: Earn 4 points when you buy this stuff. Install this fun looking strainer in your kitchen sink to spend less time hand washing dishes, and never worry about clogged drains again. The colorful outer ring provides a universal fit for commercial and home applications, but it also ensures that nothing will pass under the basket, and no amount of water flow will cause it to shift positions. Similar products are full of little holes that cause water to slow as they fill up, bu this one has long, vertical slots that catch all of the same debris without stopping the flow, or filling the sink. It'll protect your pipes for longer periods between each cleaning, and you'll be able collect way more food chunks before you need to dump it out. The bright colors, and wavy shape gives it a fun look, but that flexible outer material also clings for positioning, and provides the perfect ramp to ensure everything flows inside. Get one to replace a lost or worn part, or use one to save time when doing chores like rinsing plates, scrubbing silverware, or preparing food. Available in gray, green or pink. High Flow. It has a few round holes at the base, but the majority of them are long, vertical slots. This doesn't decrease straining ability, but it does allow for maximum water flow. Food chunks will not be able to pass through the tiny spaces, but water will flow freely in order to prevent back-up, or the need to empty the basket constantly. When compared to traditional versions that only have round holes, this one will hold more, and require less frequent emptying. Colorful. A vibrantly colored ring surrounds the colorful basket, and both combine to create a fun accent that is also functional. Choose your favorite color, or match existing decor. No matter which one you choose, it's sure to brighten up your sink while keeping your drain fee of debris. Thanks to the material used, it will also resist staining and fading in order to maintain it's look. Collects Everything. Soft and pliable, the outer edge is much more than a nice looking decoration. Some other designs might let teeny particles slip underneath, but not this one. The wide rim sits flush with the sink surface, and it hugs the material to prevent any pieces from flowing underneath. All the chunks will wash over the rim, and into the basket for collection. Stays Put. You don't need to worry the strainer itself sliding around because the same material that stops small stuff from getting underneath will also act as a non-slip base to keep it right where you place it. It's made from a silicone-like material so it's soft, flexible, and sort of grabby. The friction it creates will make it stay in place despite rushing water or other hazards. Once installed, they will conform to any shape of sink, and cling to any material it is made out of. Universal Fit. Because the colorful portion extends past the drain, it ensures a perfect fit in any set up, and it also provides a seamless entry point for any chunks flowing with the water. This product is great for regular kitchen sink drains, but would also work nicely in any other of similar size. Top Quality. Sturdy plastic is used for the center basket, and a TPR material is used to make the outer rim. Both are top quality to ensure durability and longevity. Although it's an affordable option, it's also one that you can expect to last. Use day after day without any replacement necessary. Easy To Use. Just pop it into place, and it will remain there to prevent passage of food and other stuff. It works in virtually any sink, and does not require any adjustment to fit. Simple To Empty. Don't worry about touching gross stuff, or getting your hands yucky when it's time to dispose of the junk you collected. Use the small protrusion at the center as a handle instead. Simply pinch and lift to grab the strainer and transport the garbage to your trash can. Most clogged pipes, or backed up drains are caused by unwanted objects getting washed down inside to become glued to the sides, or stuck in the middle. This is especially common in the kitchen because we prepare meals and wash dishes there. Even with thorough scraping, some food will remain to rinse off, and flow down the drain. If you don't have some sort of strainer in place, the particles will wash down and begin sticking, coating, clumping, and eventually blocking your drain. Once backed up, water will no longer flow, and the sink will start to fill up. You could call the plumber or grab a plunger each time this happens, but it's much easier to use this affordable product, and prevent it from happening in the first place. Because this will save time, effort and frustration, this simple product makes a great addition to any home, and quickly pays for itself as you begin to finish the dishes in less time. Intended as a replacement for any similar item you have now, our kitchen sink strainers offer one of the best ways to decrease the amount of stuff that washes down your drain. Using one is pretty basic, and installation only takes a second. You will not be able to plug your sink with one of these, but you will be able to catch any food particles before they clog your pipes. To use one, simply remove any drain stop or basket you have in place now. Place in center of drain. Colorful part should rest around the outside and completely cover the opening. Once full, remove by lifting up on center. Hold a single point on the outer edge to easily tap out any stubborn pieces. Hand wash or place on top rack of dishwasher for periodic cleaning. For use on any sink type with standard size, kitchen drain. Overall Dimensions 4.6" x 1.3"
Basket Dimensions 2.6" x 1.3"
Stop stuff from going down the drain. These universal sink strainers will stay firmly in place to prevent food and other unwanted items from washing down the drain. Featuring cool colors and fun shapes. Order Yours Today. It catches all of the debris and hugs the bottom of the sink where almost nothing goes down the drain. I recommend the strainer highly. You won't be disappointed. Love the gray coloring ,blends nicely with stainless steel sink Does catch a lot of crumbs etc thus ,prevent clogs in pipes. I found the first one on sale at Walmart for $1, bought it and put it to use in one of our double kitchen sinks and liked it so much that I bought the other one to match the one that I already had because Walmart no longer carried that product. I am very pleased with both of them! Thank you! best dish drains i have ever seen! they are extremely attractive dish drains. they over fit the drain which is what i was looking for and couldn’t find locally. also great color to go with stainless sink. the only problem is they are a bit loose and move around a bit, not bad. i can live with that. they also don’t lock, but i knew that in advance and will use something else if i need that. thank you - i love them and will purchase more should they wear out. but they don’t look like they will. great product!!!!! The sink strainer work well to prevent items from going into the garbage disposer. I really like this sink strainer better than the mesh one I bought at the store. I covers the drain area so that nothing gets by it. Plan on ordering more. These plastic kitchen sink strainers are excellent at stopping debris from getting down the drain. They also look nice in the sink. Their shortcomings are they are expensive to buy online, they melt if you put boiling water through them, and they take on permanent bacterial stains on their underside after 2-3 months of use. That aside, I still prefer them to stainless steel type strainers. like the strainers but never can get the gray that I really want and this pink is very bright. Works great! I have used this product for a long time. Fast delivery. Good for sink I like it. These are the best kitchen sink strainers to use and we love them. Thanks so much. I have looked everywhere for this gray color and found it with you. Received it quickly and am over the top happy. The silicone sink strainers work great. They stop 99% of the bits that usually make it down the drain. Easy to empty because stuff doesn't stick to it and then rinses clean. They have a slightly domed rim that allows water to swirl up and over the edge so nothing collects there. Good product would recommend. The strainers work great. All strainers deteriorate eventually. However, these strainers won't injury you with sharp metal edges or wires. Love them ! Bought 6 more to divide amongst my family !!! I was hesitant to try this product. I've tried so many sink strainers and none fit quite right, and I was always pulling food particles from my drain. This one really does a good job and the price was right. I am very pleased with the product and the service. I Love These Evri Strainers! This is a very functional strainer and decorative too. It definitely catches food waste, yet doesn't prevent the sink from draining out. 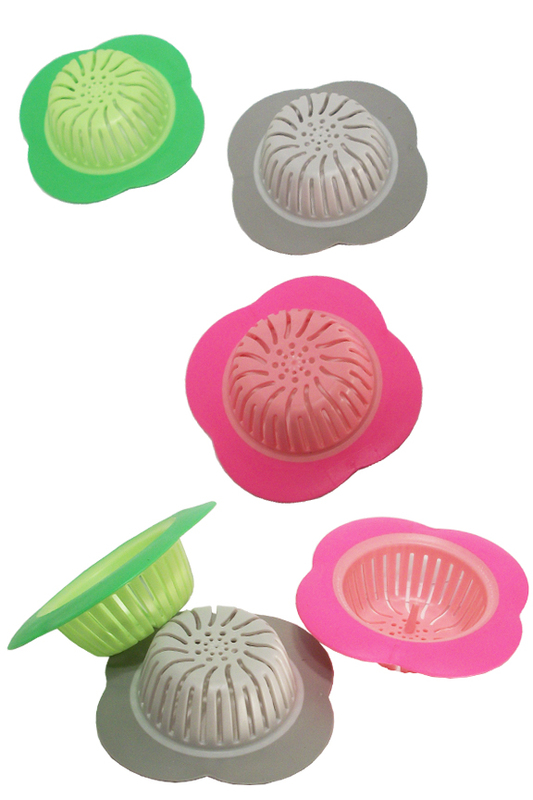 I ordered (2) of these strainers in pink and I hope you will get some more in and I would order the green and blue for gifts. Simplygoodstuff.com has the best price that I could find, including the shipping. Thank you! This is a great item. It fits nicely and is easy to empty as well as a cute color. Should have found this years ago. The Kitchen Sink Strainers are doing an outstanding job. Before the Strainers, bits of food were going down the drain. Next time, I'll purchase strainers from Simply Good. I love these kitchen sink strainers and have not been able to find them in the stores recently, so I was thrilled to find them online. My only complaint is that you only had the one color, pink (and not a pretty shade of pink). I hope you will soon have them in other colors. Stop food bits but one of the two I bought no longer sits flat in the strainer so food just goes under it. Also walking through Walmart there they were for .. and no shipping.. This is the BEST sink strainer! Like everyone else who has written a review this Evri Sink Strainer is the greatest. I also had bought one at the grocery store but when I needed to replace it I couldn't find another one. Fortunately, I found it on your web site & ordered 3. Thanks for carrying this great product. Yes, I did receive my strainers, even though they weren't the color I originally ordered, but at least my sink drains are protected once again. I've used this style of drain strainer for several years. I really like them and had a hard time finding them again after moving to Texas, then I accidently ran across Simplygoodstuff.com. I would like to order 2-blue drain strainers when they are again available. I purchased my original strainers at Albertson's supermarket in Everett WA, but was unable to find them here in Texas. I think they would go over very well here in Texas. Love these little stoppers. Easier to clean that my previous wire mesh ones and they work just as well. And the fun colors work perfectly in our camping trailer. YES, I have received my order and REALLY LOVE what I ordered. I wish there would have been more colors to choose from.. one closer to stainless steel or maybe black.. ha ha.. I never thought I would find something like this. I put some away for Christmas and saved a few for myself. Gave one to my brother and he loves his too. My sister bought the Evri-Sink Strainer in a local store and after seeing how Great it worked, I shopped around and could not find one. Luckily I found your site and ordered two. It catches all of the debris and hugs the bottom of the sink where almost nothing goes down the drain. I recommend the strainer highly. You won't be disappointed. 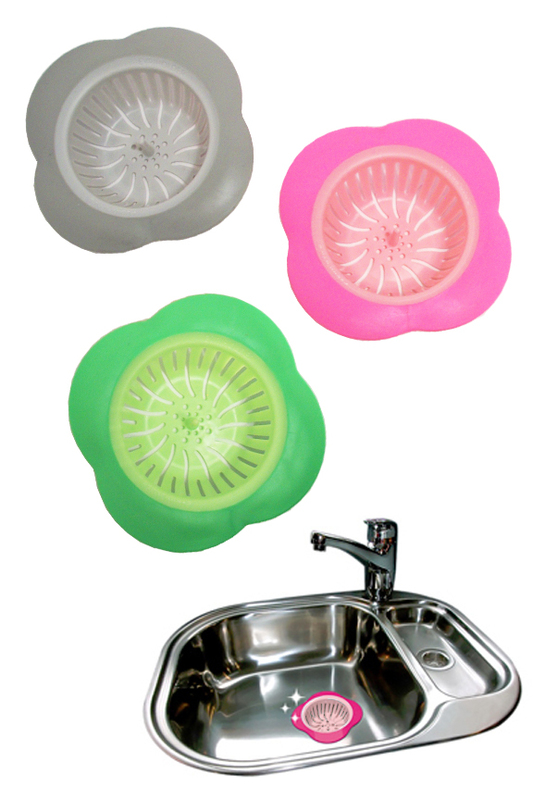 These sink strainers stay where I put them thanks to the colorful plastic outer ring. They work better for keeping debris getting into the pipes. We have a septic system and have no disposal. I highly recommend these strainers for both quality and price. Will this strainer fit any sink regardless of manufacturer? Yes. They provide a universal fit. The basket is about 2 5/8" wide, so it looks like it will be too large for your drain. Does this strainer also double as a plug if I need to fill the sink with water? No. If you need to plug the sink to fill it, you will need to remove this strainer, and use something else. Perfect For Ginger, Chocolate, Garlic and More. Professional Quality Cutlery Ideal For Any Kitchen. Available In Three Sizes. A Hand Crank Food Chopper That Also Mixes, Whips, and Dries Lettuce. Super Sharp And Incredibly Adjustable. Slice, Dice, Chop, Shred And Waffle. Super Absorbent And Padded For Protection. Drip Dry The Easy Way!